Settled or Sunken Concrete – if the concrete settled because the sub grade was not properly prepared, removal and replacement is the best option. If the sunken concrete is due to some heavy equipment or load that was placed on the concrete, then it may be possible to just raise and level the existing concrete. If your driveway, patio, or sidewalk only has thin cracks and there is no evidence of settling, it may suffice to simply patch the cracks. But if there is more widespread damage, patching the cracks and resurfacing the concrete may end up a waste of money… as the same problems will be back shortly. 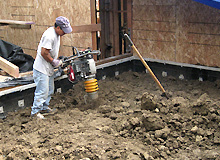 There are many tools that concrete demolition contractors may use to demolish concrete. The most common is a bobcat with a hydraulic or pneumatic breaker attachment. Usually, the contractor will have a roll off dumpster on site. After the concrete is broken, the bobcat loads the concrete into the dumpster and the dumpster is hauled away to a landfill or concrete recycler. To ensure safe removal of old concrete without any damage to surrounding structures, you must hire professional concrete removal services. When you are planning to put concrete back in the same area again, you need a qualified removal service to ensure that your old concrete is removed thoroughly and does not pose a danger to your new concrete. These services are very efficient in their techniques and methods of concrete removal. These can be one service that should not be ignored when you are looking at removing old concrete. Call for a good service now, do not compromise! Concrete tends to get damaged due to many factors like heavy traffic, weather etc. and if left untended, can deteriorate badly. These removal services are professionals who carry out their work methodically and efficiently. Concrete removal needs to be scientific and thorough, professional services can ensure this. These services can be useful in many situations like additions to old homes, demolition of old buildings etc. Whatever your needs, call for a professional service now! Concrete slabs and pads can become sunken and cracked due to improper laying or when the under gravel is not well packed, concrete removal services can come to your rescue here. Deconstruction Pro find use in all kinds of situations and they are very effective services. Good removal services are an integral part of any demolition service. To make sure that there are no adverse incidents during your removal, go with a concrete removal professional service. Removing concrete is a lot more technical than you would imagine and it is wise to use professional concrete removal services. These services can be the best choice you can make when you undertake to remove old concrete before laying new concrete, as efficient removal is necessary before beginning anew. Concrete is prone to damage easily if not poured or handled properly and removal services are an essential part of any concrete process involving removing old concrete. Call for the best of these services now!